There is only one reason to trade, and that is: To make money. We don't trade for the thrill of victory, or to prove ourselves right, or for the "excitement of the chase." We trade to make money. And that means one must be extremely cautious of the opposite outcome. Essentially, a trader is a salesperson: He attempts to buy something at a low price, and later hopes to sell it to someone else at a higher price (or, if he's a bear, he hopes to sell at a high price and buy back at a lower price). That is the essence of trading, and one would do well to approach it with that in mind. Many traders are completely preoccupied by a "fear of missing out" on the next big move, instead of being preoccupied with discernment, and making intelligent decisions. I've found it sometimes helps to make the thinking behind trading more tangible via analogy, to clear out some of our irrational fears and emotions. So: Imagine you owned a car lot. In order for your business to survive, you MUST buy cars for a significantly lower price than you sell them. You must NOT buy cars that you can't sell at all, or can't sell at a profit. And that means you have to be very selective. You can't let yourself buy every car you see -- sometimes the asking price will be too high, sometimes the car will be a junker, sometimes there will be no demand for the vehicle. You must maintain discipline in the face of your emotions, against your desire to maintain a large and glorious-looking inventory. Maybe a customer comes in and wants a Jaguar, but you don't have one -- does that mean you should then rush out and buy every Jaguar you come across, simply so you don't "miss out" the next time a customer wants a Jaguar? That would be ridiculous, wouldn't it? Yet many traders approach their sales and purchases with exactly that mindset. They don't want to "miss out" on ANYTHING. If you approached any tangible business that way, you would soon find yourself bankrupt. The same thing happens with trading. You are going to have to pass up some iffy trades if you want to survive. You are going to have to accept that, sometimes, you just don't know what the market is going to do next. Maybe it will make a dramatic move that could have made you tons of money if you'd been positioned right, but you "missed out." That's okay! That's GOOD. So what if you didn't have a Jaguar to sell that one day -- your last Jaguar sat on the lot for years, depreciating the whole time. The transmission fell out during a test drive, and you ended up selling that car for a considerable loss. You take similar losses when the market runs against you. FORGET about being part of every move. No car lot can stock a car for every single potential customer, and no trader can be part of every single move the market makes. Let the emotions go: You are in business to buy low and sell high (or sell high and buy low). That's it. Period. Onto the charts. Or, for today: Chart. I'm going to cram everything on to one chart here, because in a market like this one, it actually helps to see what we're up against. 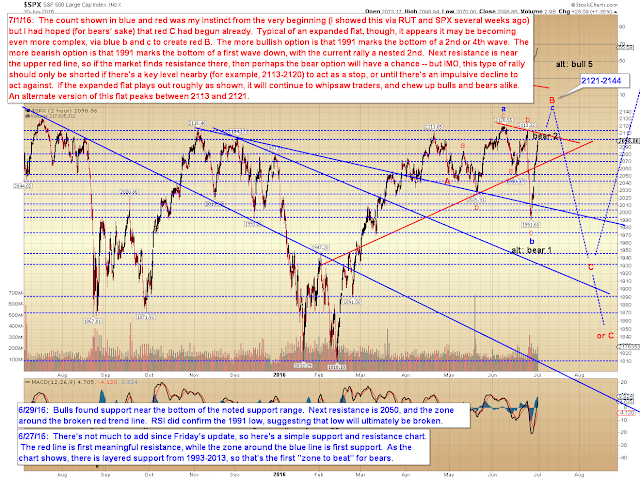 Basically, if bears are hoping that this rally is going to mark a second wave, then they need to make a stand directly. Maybe they'll do so -- we are approaching an inflection zone. The chart below also shows a count that I've been considering for a few weeks, and that I was tracking even at the recent 1991 low -- but the market decided to throw a bit of a curveball by adding another B-wave into the mix. I was hoping that we had already begun C-down, and thus was looking for a five-wave decline. 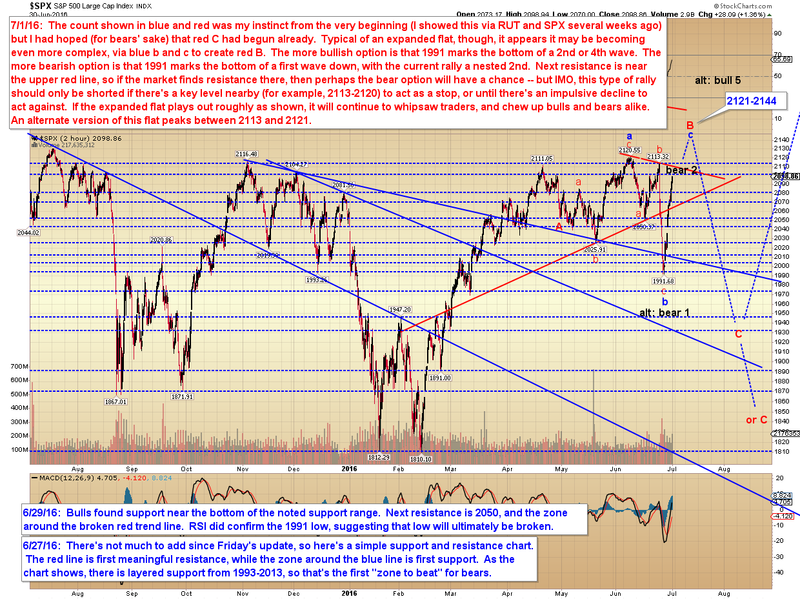 We had a three wave decline instead -- and that suggests the low is a large B-wave. It could also, of course, be a large 2nd or 4th wave ABC, which is what the true bulls are hoping for (I don't think that fits the pattern as well, though). Bears are hoping it's a nested second wave (black "bear 2"). I think there's another options, though, besides the obvious bear and bull options (which are the two options most folks will be tracking) -- the expanded flat in blue and red would punish and frustrate the greatest number of participants. In conclusion, the most bearish of the bear options (a second wave rally) remains on the table until 2120 is broken. If we do break 2120, I'd be surprised if that kicked off a new bull leg -- as I talked about in the prior update, the typical signs for a lasting bottom at 1991 aren't present, so I'd be more inclined to think it was the red B-wave and doomed to whipsaw quickly, thus chewing up both bulls and bears yet again. Trade safe.